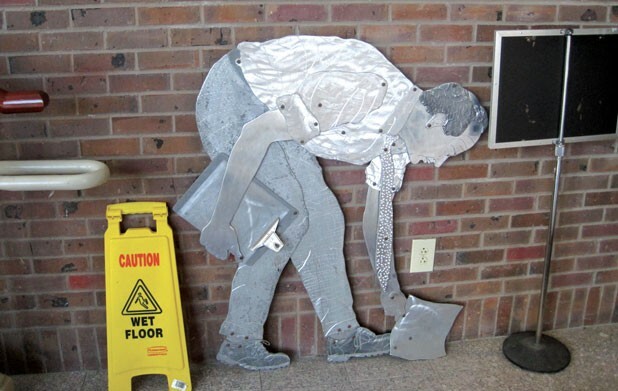 WTF: What's the story behind the sculptures at the Costello Courthouse? Most people entering the Costello Courthouse on Cherry Street in downtown Burlington have things on their minds other than art appreciation. Most won’t even notice the sculpture that’s cleverly integrated with the stairway in the building’s lobby. Observant visitors, however, may be pleasantly startled by the life-size — and lifelike — aluminum silhouettes installed 16 years ago by Montpelier artist Peter Harris. They might wonder, WTF? “Us,” reads the title on a barely legible plaque. And that’s exactly what Harris’ piece depicts. This wonderful work draws its power from the ordinary appearance of the nine individual figures it includes. They seem extraordinary in the context of a courthouse, where one expects formality and officiousness, not spontaneity and playfulness. The empathetically human forms — some ascending the steps, some descending, some standing still — are all bolted to a brick wall. Near its top, Harris has also affixed a nonfunctional balustrade that mirrors the actual railing below. Seemingly straightforward, “Us” gradually reveals itself as Escher-like in the complexity of the illusion it creates. Harris says the characters who make up “Us” were inspired by friends from the time he spent in Burlington during the 1980s and early ’90s. He photographed them in posed positions that he then rendered as cutouts from sheets of aluminum. Facial features, textures and shadings were achieved by grinding or polishing parts of the material. The result is both realistic and cartoonish. Each of the figures appears both familiar and amusing. At floor level, a man holding a clipboard in one hand bends over to pick up a piece of paper that’s fallen just beneath an actual electrical socket. It’s a self-portrait, Harris reveals, though his face is only partly visible. A few steps up the staircase, another man, wearing a hoodie with “BURLINGTON” emblazoned on its front, is craning his head to the right, as if in response to someone calling his name. One of the bolts holding him in place has been positioned to look like an ear stud. Higher up, a middle-aged woman with big eyeglasses, a plaid jacket and a long skirt appears to have just passed a man carrying a boy on his shoulders. At the top, a hippieish woman in a long skirt and hiking boots prepares to slap a high five with a bearded, ponytailed, heavyset man wearing a beret. Possibly best of all in this instantly likable bunch is the smiling teenage girl at floor level leaning against a rising part of the staircase. She’s wearing supersize shades below her bangs, while the rest of her hair cascades toward the “NO FEAR” logo on her T-shirt. Harris, 67, recalls in a telephone interview that it took him and an assistant, James Hickey, more than two weeks to install “Us” in 1996. Hickey, who is credited on the title plaque, was then a teenager enrolled in a GED course; Harris met him while teaching at Central Vermont Adult Basic Education in Barre. “Us” was commissioned as part of the Art in State Buildings program administered by the Vermont Arts Council. Harris’ sculpture is one of about 50 works that have been put on display in 30 state buildings since the program began in 1988. Its acquisitions budget has remained fixed at $50,000 for each of the past 24 years, notes Michele Bailey, program director for the arts council. The $20,000 paid to Harris for “Us” thus accounted for nearly half of the program’s yearly allocation. When the state constructs or renovates a building, the council puts out a call for artists to submit sketches of proposed site-specific works based on photos or architectural drawings of the envisioned display area, Bailey explains. The entries are vetted by a committee composed of local artists and workers in a particular building, with the final selection made by a panel that includes state legislators, the commissioner of the Vermont Department of Buildings and General Services, and the director of the arts council. Chittenden County Sheriff Officer Stuart Ashley, who has been standing guard in the courthouse lobby for the past seven years, says he has come especially to enjoy looking at the reflections of Harris’ figures in the windows facing Cherry Street. “It’s cool the way you can see them in the glass and then turn around and see them on the stairs,” Ashley says.